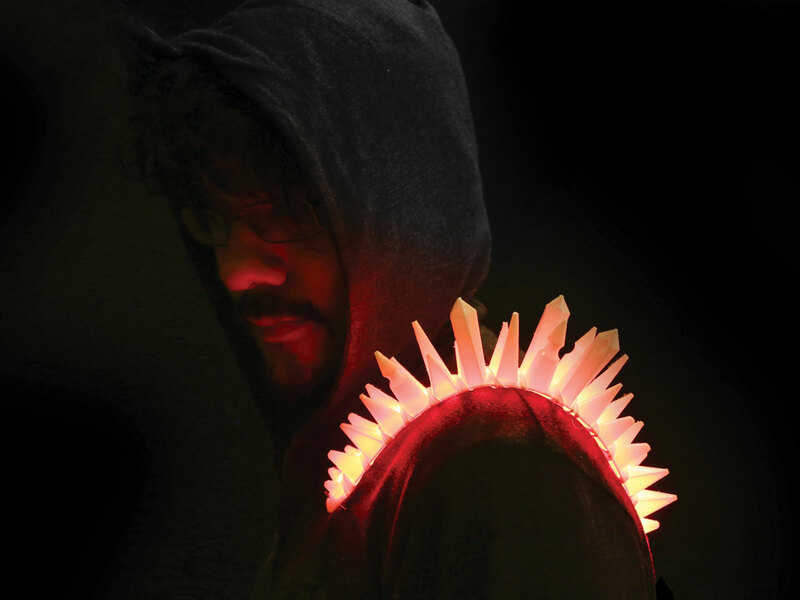 Make your own flexible, spiky, glowing accessory using NeoPixel LED strip lights diffused by NinjaFlex flexible 3D printing filament! Magnets let you attach the spikes to anything in your wardrobe. The soft flexible enclosure holds Gemma, the tiny microcontroller that animates the LEDs, and a rechargeable lithium polymer battery. We designed 2 styles of spike strip — one with regular round spikes and one crystal-inspired statement piece. Whichever you choose, it’ll get you noticed! Download whichever spikes you like from thingiverse.com/thing:262494 and print them in NinjaFlex filament at 225°F with a nonheated build plate. For more tips on working with NinjaFlex, check out the guide by the Ruiz Brothers at learn.adafruit.com/3d-printing-with-ninjaflex. Also download and print the 2 pieces of the flexible enclosure for the Gemma micro-controller and battery, from thingiverse.com/thing:262522. Since it’s printed in NinjaFlex, the enclosure is soft and flexible, yet firm enough to protect your components. The enclosure shape includes tabs for pinning or sewing to your garment. Prepare the input end of your NeoPixel strip by tinning the pads with solder. The strip won’t work if you solder wires to the wrong end, so be sure the arrows on the PCB point away from the end you’re wiring. Solder 3 stranded wires, about 8" long, to the tinned pads of the NeoPixel strip. To prevent the solder joints from being too cramped, solder the center pad’s wire on the reverse side of the PCB as shown: 2 on top, one on bottom. Wrap 3 rare-earth magnets in tape to prevent short circuits, and slide them into the NeoPixel strip sheathing on the underside of the PCB. Our spike strip is 16 pixels long, and we used 3 magnets evenly spaced (one at each end and one in the center). Prepare a protected work surface in an area with good ventilation. 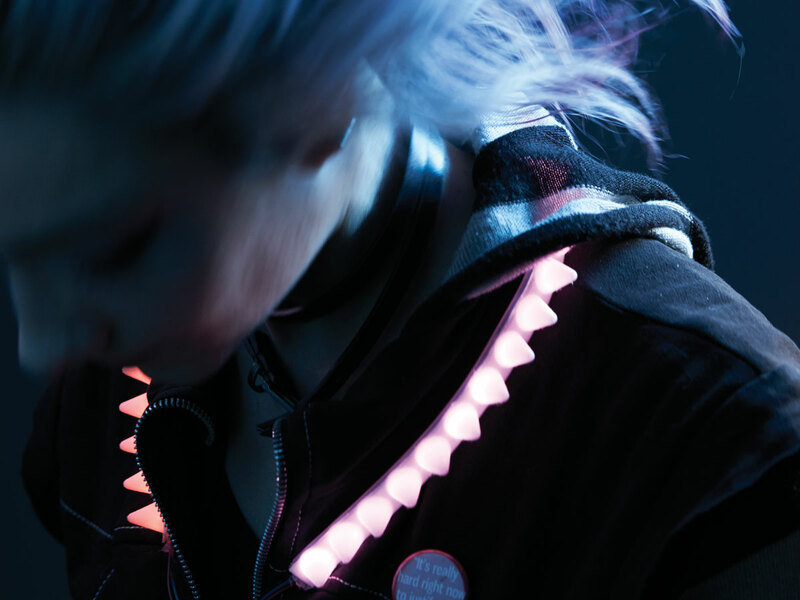 Use Permatex 66B silicone adhesive to affix the 3D-printed spikes to the NeoPixel strip. Apply adhesive to both the strip’s silicone sheathing and the NinjaFlex strip of spikes, using a toothpick to spread it around if necessary. Squish a bit of silicone adhesive into the ends of the NeoPixel strip sheathing to provide water resistance and strain relief. Allow adhesive to dry overnight. Route your NeoPixel strip’s wires through the hole at the top of the enclosure, and solder them up to Gemma as follows: NeoPixel GND to Gemma GND; NeoPixel + to Gemma Vout; and NeoPixel signal to Gemma D1. Seat Gemma into the round outline inside the enclosure, with the USB port facing its opening at the bottom end of the enclosure. Use a JST extension and slide switch to make this tiny adapter. Solder the connections as shown, and insulate with heat-shrink tubing. The slide switch fits into the opening in the enclosure. Now you can easily power up your circuit while still making it easy to disconnect the battery for recharging. Connect the battery, fit everything neatly in the enclosure, and press on the lid. Download the NeoPixel library from github.com/adafruit/Adafruit_NeoPixel. Rename the folder (containing the Adafruit_NeoPixel.h and .cpp files) to Adafruit_NeoPixel (with the underscore and everything), and place it alongside your other Arduino libraries, typically in your [home folder]/Documents/Arduino/Libraries folder. Now open the strandtest.ino sketch from the Examples sub-folder, and upload it to the Gemma using the Arduino IDE. Did that sound like gibberish to you? It’s easy — if it’s your first time, just read the “Introducing Gemma” and “NeoPixel” guides at learn.adafruit.com before you start. The code is well commented to guide you through each part of the sketch and what it does. Let’s have a look in the next few steps. All NeoPixel sketches begin by including the header file Adafruit_NeoPixel.h. The pin to which the NeoPixel strip is connected. Normally this would be a pin number, but we previously declared the symbol PIN to refer to it by name here. The next block of code lets you define favorite colors, which the NeoPixel will call upon later (see image). The next 3 arguments are the pixel color, expressed as numerical brightness levels for red, green, and blue, where 0 is dimmest (off) and 255 is maximum brightness. An alternate syntax has just 2 arguments: strip.setPixelColor(n, color); Here, color is a 32-bit type that merges the red, green, and blue values into a single number. This is sometimes easier or faster for programs to work with; you’ll see the strandtest code uses both syntaxes in different places. Then later you can just pass magenta as an argument to setPixelColor rather than the separate red, green, and blue numbers each time. NOTE: setPixelColor() does not have an immediate effect on the LEDs. To “push” the color data to the strip, call show(): strip.show(); This updates the whole strip at once, and despite the extra step is actually a good thing. If every call to setPixelColor() had an immediate effect, animation would appear jumpy rather than buttery smooth. In the strandtest example, loop() doesn’t set any pixel colors on its own — it calls other functions that create animated effects. So ignore it for now and look ahead, inside the individual functions, to see how the strip is controlled. flash or fade random pixels. Use a fluffy bun-maker hair accessory and tuck the enclosure under it to wear the spikes around your head. Cyber dragon, anyone? Try the crystal-inspired spikes. How will you wear it? We’d love to see your variations!